JCDecaux - the French multinational giant - is the largest display advertising company in the world. 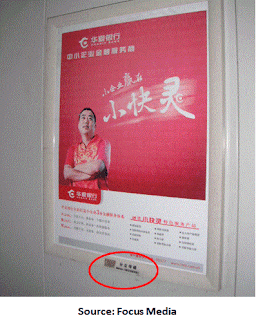 They also claim in their latest annual report to be the largest display advertising business in China. Every year they publish in their annual report a list of the largest display advertising businesses in the world - their competitors. 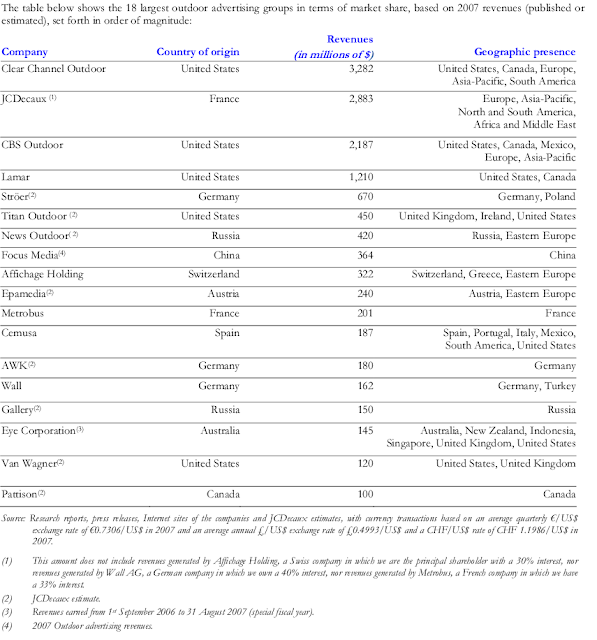 On this list, Focus Media is the 8th largest company in the world in this space. Again we see Focus Media - now the sixth largest display advertising company in the world. Peculiarly Focus Media is nowhere to be seen on this list (by the end of 2009 it should have risen to fifth place). Focus Media is no longer mentioned in JCDecaux's 2010 and 2011 accounts. The first is that JCDecaux want to sustain their claim of being the biggest display advertising business in China - a claim that is simply not tenable if they include Focus Media in the comparison. Moreover they don't want to increase the credibility with advertisers of Focus Media and its products. After all Focus Media has substantially outperformed JCDecaux in China - growing much faster and at much fatter margins. An alternative hypothesis is that they don't believe Focus Media's numbers. PS. I first found these lists when researching China Media Express. CCME supposedly competed with JCDecaux in placing adverts on public transport (in CCME's case mostly buses including airport buses). CCME however was a complete fraud and the stock now trades at 2c. 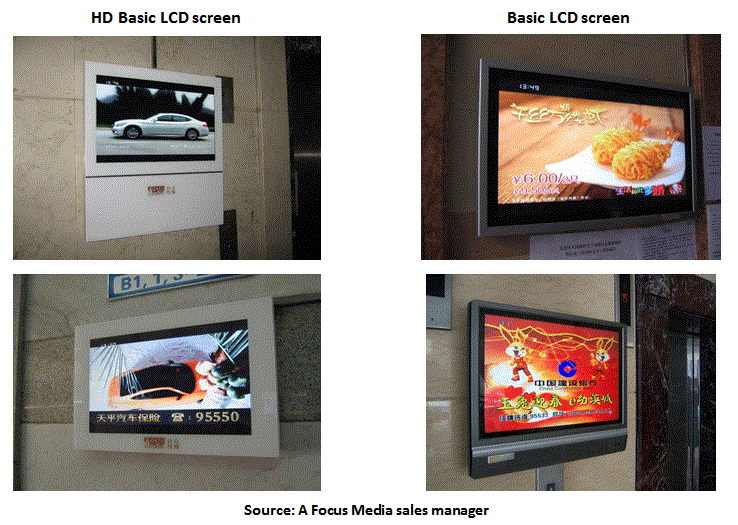 Focus Media is obviously real - their displays are widespread. Focus Media is - on the published accounts - a very profitable company. It has 63 percent margins gross margins and net margins over 30 percent (all cash returns) in a business where industry comparable net margins are generally substantially lower. I want you (dear readers) to study these as they are key to the whole Focus Media story and this is the key post in this sequence. In 2008 for instance Focus Media had gross profit of $274 million. But it also had an impairment loss of 377.6 million and other operating expenses (associated with discontinued businesses) of a further 183 million. On top of this it had a loss of 300.7 million from discontinued operations. This wound up in the small manner of USD770.7 million in loss for the year. I stand to be corrected but that is one of the largest losses ever incurred by a public company in China. Whatever - it is a very big number. Write downs and losses from discontinued operations were a feature of 2009 as well. The aggregate profit for Focus Media over five years is a net loss of over half a billion dollars. This is very strange. Focus Media is a hyper-profitable business that makes huge losses. They made these losses on businesses that they have purchased and disposed of (at a loss) and businesses that they have purchased and discontinued after operating losses. Some of the disclosures regarding the disposals are unusual. For instance there are many instances I can find of a company being purchased for a lot of money and then given back to the original owners (see the discussion of 2009 dispositions for a few examples). When a business is purchased for a lot of money and then given away to its original owners you would expect the SEC to raise their eyebrows. However Focus Media has insisted in multiple documents that the recipients of this largesse are not related parties. I am going to give you four possible interpretations of the accounts. I am not doing due diligence on this company, I have no access to inside information and can only make educated guesses as to the probability that any of these interpretations is correct. However as the company has been audited you would have to guess that (A) below is most likely. The first interpretation is that the accounts are absolutely straight and the company is absolutely straight. As these accounts are audited by Deloitte this is the situation you would normally expect. In that case this is a stupendously profitable company where the profits over the years (and then another half a billion dollars) have been squandered by existing management on a bunch of really bad acquisitions. If Interpretation A is correct the Private Equity buyers will get a fantastic deal with this transaction. After all - they will be buying a stupendously profitable company and the PE buyers - if they have any skill at all - will take over the capital allocation. The really bad acquisitions will stop. The second interpretation is that this is a hugely profitable company that has over time over half a billion dollars in operating profits - but the management of the company are venal and have stolen this money by buying assets from friends (or related parties) at inflated prices. When I see a set of accounts that look like this looting is the first thing I think of. After all - audited accounts for 2011 show that this is a really great company - however over time that greatness has accrued primarily to the people they have purchased assets from. I guess that is why the SEC wanted - in their correspondence - to assure themselves that the parties that sold assets to Focus Media were not related parties. I have no particular reason to believe or disbelieve the assurances of Focus Media on that issue other than that I would expect Deloitte to have examined the matter. If Interpretation B is the case then the PE buyers should still probably close the deal (they will be buying a stupendously profitable business). But PE buyers will have their work cut out. The current management (who it appears have done a fantastic job of running the business) are - in this interpretation - crooks - who need to be watched abnormally closely. You probably want to leave then running the business - but you certainly don't want them near the money. A third interpretation is that the money was deliberately lost by the company through all those acquisitions and the losses funded bribes. In this interpretation the company did not really “lose” the money. Its payments was bribes that if honestly accounted the company might have expensed. If this interpretation is correct then the private equity buyers will walk. Firstly, if properly accounted the bribes would be expensed - and that would bring the business down to a normal level of profitability. This is - in interpretation C - not a massively profitable business. Moreover Carlyle in particular cannot run this business – because after the change in ownership the recipients of the bribes won't stay bought – and Carlyle - as owners - can't buy them again because it would expose Carlyle to the Foreign Corrupt Practices Act. The FCPA is probably the most commonly criminally enforced white-collar crime provision in the US. A reputable American firm does not want to go there. Interpretation D suggests that no looting is involved. Instead the company has consistently faked its revenue up by reporting as revenue money it never received and never will receive. The problem with reporting as revenue money never received is that over time the books don't balance. Auditors go looking for the cash and it is not there because it was never received. In that case the company has to pull some stunts to make the books balance. The easiest way is to take their fake cash and make a fake acquisition. That makes the fake cash disappear into fake goodwill. Over time you have to write off that fake goodwill otherwise the auditor will go looking for the attached asset. To make sure the auditor can't look for the fake asset you either close it or give it away. Then it is gone for good - but you get a write-off as you do this. In this interpretation those write-offs have tallied over a billion dollars. In this case the PE buyers don't want to buy the company. They are buying a business that is break-even not profitable. The acquisitions made (and losses taken) are simply the way in which the books balance. Muddy Waters published quite a deal of material that was consistent with but did not prove interpretation D. Some of this is well known. For instance this company has a habit of buying assets for large sums, running them for a while and giving them back to the original vendor. That is certainly consistent with Interpretation D.
Moreover some evidence exists that the revenue numbers are on the high side. For instance the seemingly high level of revenue per screen (as per this post) is consistent with Interpretation D. Previous disclosures where they appear to have overstated the number of screens are also consistent with Interpretation D.
To the Private Equity buyers: in doing due-diligence on this company you need to think about Interpretation D and how you test for it. Because if D is right then - dear Private Equity buyers - you are buying a turkey. What is the stock worth in interpretation D? Interpretation D is the interpretation with the sharpest negative implications for the stock. What is says is that the entire numbers of this company are garbage - and the real profitability - evidenced over the last five years - is likely negative or somewhere near it. I am obsessed as to what the due-diligence on Focus Media done by the private equity firms might look like and what it might find. Probably the easiest place to do due-diligence on Focus Media is the theatre screen business. Focus Media claims to display advertising on roughly a quarter of the cinema screens in China - but this is still a relatively small number of cinema complexes (316 at last annual report). It is almost impossible to audit more than 100 thousand LCD screens - at least without a small army and a sampling method. But checking out whether the numbers make sense in 316 theatres is relatively simple. A sample could include a large proportion of the total without being prohibitively expensive. Those 316 theatres probably have only 30-40 owners (most owners own chains). That will make the testing easier still. And I think the private equity bidders probably will test this (as part of their due-diligence) because the theatre business raises red-flags which animate the bears in this stock. The central issue seems to be the number of theatres and the size of the multiplexes - however I think Focus have largely cleared up that story. But I should run you through it anyway. You would think that counting cinema screens and number of theatres is easy. They are big things. They don't run away. If I said I was opening a film on 270 screens you would know what I mean. These statistics have well defined meanings - and those meanings don't seem to change much. Except in the case of Focus Media. Net advertising service cost-movie theatre and traditional outdoor billboards. We incurred advertising service cost of $56.9 million in 2008, a 99.6% increase from $28.5 million in 2007. The increase is primarily due to (1) our acquisition of Huaguang, the subsidiary operating the traditional billboard business in 2007. We consolidated Huaguang’s results of operation only after the acquisition was consummated, while in 2008 we consolidated their full year costs of revenues; (2) the increase in the number of billboards leased from 492 in 2007 to 542 in 2008 in response to greater customer demand; and (3) increased leasing costs associated with time we rent on movie theatre screens as a result of an increase in the number of theaters we leased in our network from 10,930 in 2007 to 27,164 in 2008. The bold section is pretty clear... a result in the increase in the number of theatres we leased in our network ... to 27,164 in 2008. This number and similarly large numbers are laced throughout Focus Media's filings. It is not a one-off number. There is a problem with this number. There are not that many theatres or screens in China! In March 2011 the LA Times did a story on the cinema building binge in China. At that point there were 6,200 screens in all of China up very sharply since 2008. According to Government statistics there were only 1545 screens in all of China at the end of 2008. Focus media says they had 27,164 screens. The government says there were only 1,545 screens in the country. We operate our movie theater advertising network by selling leased screen time as time slots to advertisers. We have the right to screen time prior to the screening of each movie shown in the theater. As of December 31, 2011, we had rights to lease advertising time on screens in 316 movie theaters (consisting 2,190 screens) in cities across China. How did they reconcile these numbers? Well they said that they counted as a "theatre" a "screen in which an advertiser had agreed to buy space". That means if 10 advertisers had chosen to show advertisements in a theatre with one physical screen they counted it as 10 theatres. As of December 31, 2010, we had rights to lease advertising time on screens in 260 movie theaters (consisting 1,553 screens) in cities across China and Hong Kong SAR. 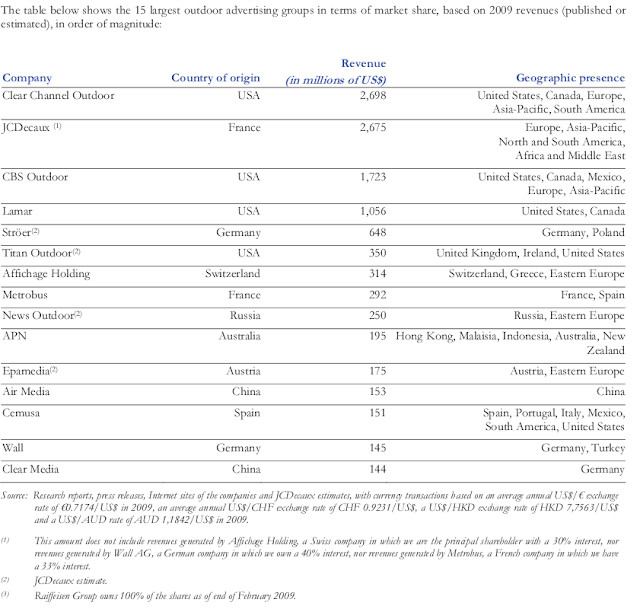 Prior to 2009, we calculated the size of its movie theater network by calculating the number of screens on which each of its advertisers had purchased advertising and then summing the screen count for each advertiser to produce an aggregate number of screens. With a change in management in late 2008, we changed the method for calculating this operating metric beginning in 2009, basing it instead on the number of movie theaters for which we had rights to lease advertising time as of the relevant period, regardless of the number of screens in such theaters or the number of advertisers that had purchased advertising on each such screen. The large decrease in screen count for the movie theater network over this period was a reflection of this change in calculation methodology. That is a mess. At minimum it is a definition of theatres that I was previously unfamiliar with. But Focus now tell us what they say are the true numbers on standard definitions - numbers that I have no ability to prove, nor disprove, but that I would expect would be part of the due-diligence brief that the Carlyle and others will undertake. Ask them to tell you a list of all screens. Pick a screen out-of-town. Ask them to tell you what adverts are on it. They should have records because they need to bill the advertiser (if they claim no records you know they are fraudulent). Then take yourself to the cinema. Have some popcorn. If you really want a good time do it on a sample-basis - check five screens and catch up all the films you missed out on. Who said being an investment banker or PE guy you don't have time to go to the flicks! Focus Media's theatre screen business has a fat margin. According to the last annual filing the revenue associated with this business was USD50.8 million. The costs USD25.7 million. This is a gross margin a little over 50 percent - considerably larger than display advertising businesses outside China. Indeed this is a fatter margin than any non-Chinese display advertising business I can find. But the margin has been that fat for years. And the multiplex developers are almost by definition large property developers used to screwing as much revenue out of projects as possible. Moreover this company is on-the-numbers very heavily into multiplexes. Between 2010 and 2011 they added 56 theatres and 637 screens. The incremental theatre seemed to have something like 11 screens. An explanation that large-scale property developers are more stupid than local governments looks difficult to sustain. Maybe they are - but local governments don't stay that stupid (the renegotiated street furniture terms are never as sweet) and Chinese multiplex owners will learn too. The largest Chinese multiplex owner now owns AMC in America. AMC probably know a few things about maximizing the revenue on their screens. Unless I am mistaken - as the screen owners wise-up (just like local governments wise-up) the margin in this business is going to come down. Unless there is some magic-secret-sauce in this business I don't understand. Sustainability of margin is likely to be a problem. The number of screens started 2011 at 1553 according to the disclosures above. They ended at 2190. A simple arithmetic average suggests the company averaged about 1870 screens. Revenue for the year was USD50.8 million. That is revenue per screen of USD27,144. I spent a lot of time trying to work out whether this number was plausible - and found that it was high but still plausible. I found an American media executive familiar with this industry who told me that the revenue per screen in the US was about USD20-30 thousand. Focus Media is on the high-end of that but still within the range. Advertising rates in China are usually a fair bit lower than the US - perhaps cinema screens are an exception. On these numbers rates look to be about the same as the US. I have no particular reason to doubt the new number of screens that Focus Media claim to run. The old number was false - but according to Focus Media the problem was one of counting methodology - not fraud. The new number of screens is about a quarter the total in China - that would surely make them one of the major players. And they are very multiplex focused with average screens per theatre way higher than average and climbing sharply. Usually I would assume that multiplex owners were a sophisticated lot who did not leave a fat margin on the table for a player like Focus Media. But there is a 50 percent margin here in a business you would normally expect to have a thin margin. After all the eyeballs belong to the theatre owner and not to Focus Media. They must be doing something special. Some magical secret sauce if you will. As I said in the first post I wish I were a fly-on-the-wall whilst due diligence is done on that company. I want to understand that secret sauce. It is clearly a way of making money and that is what my clients pay me for. I believe you judge the quality of a private equity firm by its ability to say no to a deal. People will sell you anything based on numbers or projections and at minimum what you needed to do was follow Ronald Reagan's dictum: trust but verify. Focus Media (my new obsession) is a deal requiring verification. Focus Media's buyout is attractive on the stated numbers. As of the last results Focus had 758 million dollars in cash, restricted cash and short term investments - and a little over 200 million in borrowings (net cash of above 500 million) and was earning roughly 83 million of operating profits (on their non-GAAP measure) per quarter (call that 330 million per year). Moreover the company has history of very fast growth. The incremental capital returned for growth is low - so incremental ROEs are very high. If these numbers are real and sustainable the Private Equity bid to take the company private is likely to be a lay-down winner. Especially if the growth continues. However these numbers must be verified. Rat-bag short-sellers have argued this company has fraudulent numbers. Allegations to that effect are all over Seeking Apha for instance. Muddy Waters - the firm that bought down Sino Forest - have published an 80 page report detailing what they believe are frauds at Focus Media. That said, short sellers can be wrong. And the Private Equity firms may be buying a bargain - a bargain driven to bargain levels by nefarious (or just plain erroneous) short sellers. Private Equity buyers can do something that us poor equity investors can't. They can do thorough due diligence. They can check the transactions, they can talk to staff at all levels, they can forensically examine the books. They can probably even ring Carson Block at Muddy Waters (the most prominent critic) and ask him to send his most damning evidence - and they can seek to confirm or falsify Carson's arguments. If an ordinary investor tried to do what would be ordinary business for a PE firm they would be guilty of insider trading. In other words they can check whether it is a fraud and you - dear readers - cannot. They have a competitive advantage over you and they have a competitive advantage over me. And being competent (at least I presume Carlyle, FountainVest etc are competent) they will use that advantage. To that end though I wish to start them on their way. The US Securities and exchange commission has specific correspondence with US listed firms when they question something in the accounts. Sometimes this correspondence is kept private. Sometimes it is included in filings. Sometimes it leads to formal SEC inquiries which may or may not be made public. Here is a list - with links - of the released component of the formal public correspondence between the SEC and Focus Media. 1. Letter dated 1 October 2010 requesting more time for answering questions from SEC staff. 2. A further letter - dated 28 October 2010 asking for more time for answering questions from SEC staff. 3. A further letter - dated 19 November 2010 asking for still more time for answering questions from SEC staff. 4. A relatively long set of answers dated 10 December 2010. There are a few things I learned here - like that the controller of Focus Media (Jason Jiang or JJ for short) has taken out Singapore citizenship. There are other things that travel closer to the Muddy Waters allegations (such as goodwill write-downs). This filing was accompanied by an amended annual report. 5. A letter dated 9 January 2012 requesting more time to answer SEC requests. 7. Another long letter dated 13 February 2012 responding to more SEC questions. This letter was also accompanied by an amended annual filing. 8. A letter dated 6 March 2012 which requests more time to respond to SEC inquiries. 9. A letter dated 22 March 2012 which also required amended annual filings. 10. A letter dated 3 April 2012 requesting more time to file amended annual filings. 11. A letter dated 18 April 2012 requesting more time to amend annual filings - but also answering basic questions of financial control (like possession of the chops). 12. A letter dated 24 April 2012 accompanying amended filings. Phew - that was a lot. These letters are not easy reading. Here is my point: if a bunch of lawyers without access to inside information at the SEC office can think of such an extensive and difficult to answer set of questions then the private equity firms - with inside information - should be able to ask and answer many more questions. These questions only scrape at the beginning of what the more vocal (but possibly less credible) shorts have been saying about the company. The private sector due diligence people are possibly more competent than the SEC officers (certainly they are paid far more) and they have full access to the books in China. So this due diligence should be done and it should be thorough. Further because of the allegations around this company a thorough due diligence will be expected. It would be deeply embarrassing for a PE fund to close this deal and afterwards determine that they had been swindled (as per the way Richard Heckman was swindled in China). Further - given that the SEC has paid a fair bit of attention to this company - you can guess that at least some people at the SEC have their doubts about this company and its disclosures. If a PE firm were to buy this company and later discover it was a fraud they would run a real and nasty risk that the SEC would switch their investigation to them. The risks to the private equity firms are thus uniquely high here. This is a large cheap transactions with an extensive SEC history of investigation and with untested fraud allegations. If the PE buyers are right they make good money. And as it is the biggest deal in China that win could be huge. But if the people alleging fraud are right not only will the PE firms lose money, but they will lose a lot of reputation and they will probably score a major SEC investigation into the process. Big rewards. Big risks. And all soluble with thorough due diligence. This is a corrected version of a previous post. In the original I transcribed gross margins for operating margins in two companies. The comparison was fair - Focus Media was much higher margin whichever margin I quoted. It is just that I was quoting the wrong margin. The reason for using posters is inconveniences like having no available power supply. There has been some dispute about the number of screens and posters but there is no doubt that the company has a lot of these - they are visible around major cities in China. The company also claims to have the right to sell advertising on a large number of movie cinema screens. Again there is a dispute about the number of these screens. Focus Media is a relatively simple business. They rent sites (for instance by entering a lease with the managers of a large tower with elevators they wish to place adverts in). They sell the advertising space and they maintain all their screens and update your posters and deal with the inevitable things like vandalism, theft and the like. For the number of sites that Focus deals with they would need a fairly large number of lowly paid staff for maintenance and another group of staff selling advertisements and a third group negotiating lease arrangements with building and cinema owners. The second and third group will have higher salaries. The maintenance cannot be neglected because it devalues adverts when kids scrawl little goatie-beards on the pictured women (or worse). The most notable thing about Focus from the accounts is their startling profitability. Their last annual report shows revenues (net of business taxes) of USD793 million and gross profit of 503 million, operating profit is 259 million. This is a 63 percent gross margin and a an operating of margin of 32.7 percent which is at the high end for a media business. In my experience media businesses are 10-35 percent operating margin businesses - with the high numbers reserved for very special franchises. A monopoly newspaper in a city of a million people (say Perth Australia) used to have a 35 percent margin before the internet threatened the monopoly. Most businesses are closer 20 percent. Most display advertising businesses (which are without strongly identifiable franchises) earn closer to 10 percent margins. Moreover, this is a a nearly 33 percent margin where the company itself describes the landscape as "competitive" in their annual filings. The margins are surprising – but China is a surprising place in many ways – and it is possible that margins are fat because the landlords who lease the space to Focus are stupid. The fat margins may be possible for other reasons I don't understand. First let me stress though just how fat these margins are. The largest player globally in display advertising is JCDecaux (the French multinational founded by Jean-Claude Decaux). They have - according to their last accounts - €2463 million in revenue and 23.6 percent gross margins. The 63 percent gross margin at Focus is fully 40 percentage points higher than the gross margin of JCDecaux. The net margin of JCDecaux is a mere 8.7 percent - Focus Media margins are 3.7 times higher than JCDecaux. 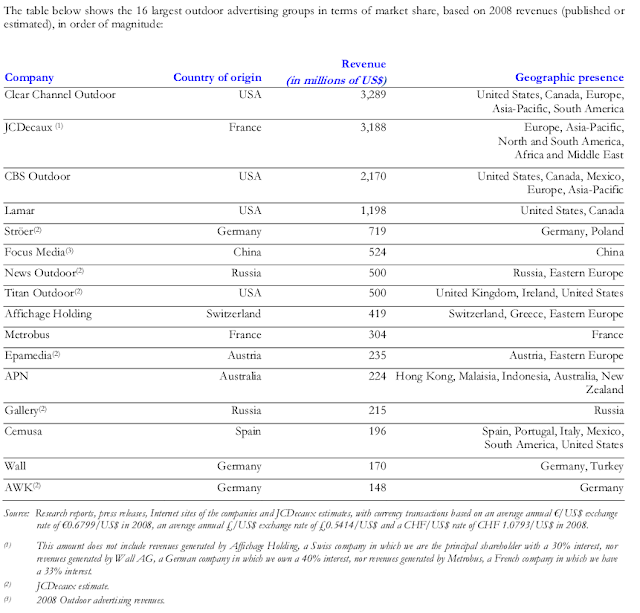 Moreover JCDecaux has fatter and thinner margin businesses. It has a mid teens gross margin outside their (franchise) street furniture business. There are several possible explanations for the very fat margins at Focus. The most obvious explanation is that they were early... when you go around to a landlord and offer to rent their space they don't know what that space is worth (because the idea is new to them) and they lease it to you for too little. Over time margins contract because the landlords "wise-up". This is certainly true in the street-furniture business at JCDecaux where the company goes to the local government and offers to maintain their bus-stops for "nothing" and the local government (with the intellectual panache that describes that sector) just accepts. But local governments have wised up over time. The main allegation against Focus came from Muddy Waters - the same firm that exposed the fraud at Sino Forest. MW gave us an 80 page report (that is freely available on their website). Sino-Forest was deep within my area of expertise and I was more-or-less instantly convinced that the whole Sino Forest story was made up. Focus Media is a much harder target for Muddy Waters because the company clearly exists. Their LCD screens and picture frames are pervasive in many large cities in China. Whilst I was instantly convinced by the Sino Forest case (and hence was happy to short the stock to zero) it is harder to be convinced when the business so clearly does exist. That said Carson Block and his Muddy Waters firm comes with some credibility because they predicated the complete demise of Rhino International and Sino Forest (both multi-billion dollar firms). Given Carson's street-cred I was surprised that Focus Media stock held up so well after Carson's attack. Some people clearly saw a lot of value in Focus even if some part of Carson's allegations was correct. The bidders are a who-is-who of reputable private equity firms. FountainVest is run by Frank Tang who used to head China investments for Temasek (the Singapore Sovereign Wealth Fund). He represents Singapore Inc as much as a private individual can. The Carlyle Group is one of the largest private equity firms in the world. I have had my doubts about their China investments before - but they are large and reputable. CITIC Capital is a private equity firm associated with China International Trust and Investment Corporation which is effectively the Chinese sovereign wealth fund. CITIC Capital however is not the Sovereign Fund - rather an associated private fund. By all accounts it is Princeling Central. China Everbright is a Hong Kong listed financial firm clearly with links to the Chinese establishment. Bo Xilai's brother recently quit as a director. This group is a mix of Chinese, other Asian and Western establishment firms. One bank mentioned in the press release is DBS - which again represents Singapore Inc. The only other bank mentioned is Citigroup - and they have provided a "confident" letter. What we have are some high-profile but rat-bag shorts on one side squealing fraud. And on the other side we have a who's who of Asian business wanting to take this private for the not-so-trivial sum of USD3.5 billion. You see why I am obsessed? Right up my alley. And perhaps a test of my Guanxi vs Analyst thesis. This sounds like a done-deal. The largest shareholder in Focus is Fosun International - an HK conglomerate. They have publicly called the bid "attractive". The bid team contains Mr. Jason Nanchun Jiang - the CEO/Founder of Focus - and a man critical to the running of the business (apart from anything he controls the variable interest entity). Given that it contains the critical person and the main shareholder wants to accept it is likely the board will go along. And the bid is cheap enough that it is unlikely that - absent absolutely grotesque fraud - nothing that is found on due diligence will dissuade the buyers. The parties are rich enough that $3.5 billion is a big - but not an intolerably large bite. They are up for it. 13. No Binding Commitment. This letter constitutes only a preliminary indication of our interest, and does not constitute any binding commitment with respect to the Acquisition. A binding commitment will result only from the execution of Definitive Agreements, and then will be on terms and conditions provided in such documentation. And so we have a due-diligence period in which some of the most reputable and largest private equity firms will do due diligence on a company that one of the most famous rat-bag short-sellers asserts is a fraud. I would love to be a fly-on-the-wall as they work out how to test the Muddy Waters allegations. Due diligence is sometimes (incorrectly) treated as a formality. But in this case the stakes are real. Billions of dollars are on the line and the very credibility of some firms (especially Carlye) are on the line with it. Carlyle has been burnt by some frauds in Asia before. If - after warning by Muddy Waters - Carlyle were to buy this firm and it turned out to be fraudulent the question would arise as to whether Carlyle staff were deliberately buying frauds to loot the Carlyle funds. My guess is that the very existence of Carlyle is at stake. But Carlyle have competent staff laced throughout their organization. They will do their due diligence - and if the deal closes I think you can presume that Muddy Waters was wrong. If the deal doesn't close with the backing of the the largest shareholder and at this pricing then you probably have to conclude that Muddy Waters is right. If Muddy Waters is right then the revenue and the margins of this firm are grotesquely overstated and the stock is probably going to settle somewhere below two dollars. And with that you understand my obsession. Disclosure: I think there is a reasonable chance that Carlyle - and perhaps some of the other firms in this syndicate will walk. In all honesty I have no idea whether they will or not but as the stock will wind up at $2 (or less) if they walk the bet is worth taking. So I am short and risk losing the difference between the current price (25 and change) and the bid price (27) if the deal does close.